Get your Raspberry Pi device's IP address and connect from your mobile phone using the RaspiCam-Remote mobile app. Make sure you are able to view the inside of your fridge or kitchen cabinet on your mobile phone. I have uploaded a python script Smart-Fridge.py in my git repository under Smart-Home. This script takes a snapshot image with Pi camera, performs image recognition using AWS Rekognition API, prints the list of items found in the image on STDOUT, and also produces audio output using the Text-to-Speech API of AWS Polly, which is played on the external speaker connected to Raspberry Pi via bluetooth. The script can be run remotely from any computer connected to the Raspberry Pi device via VNCor SSH. Build some Alexa Skills so you can access your Raspberry Pi device from Alexa Echo. Ask Alexa "Hey Alexa, what's in my fridge?" 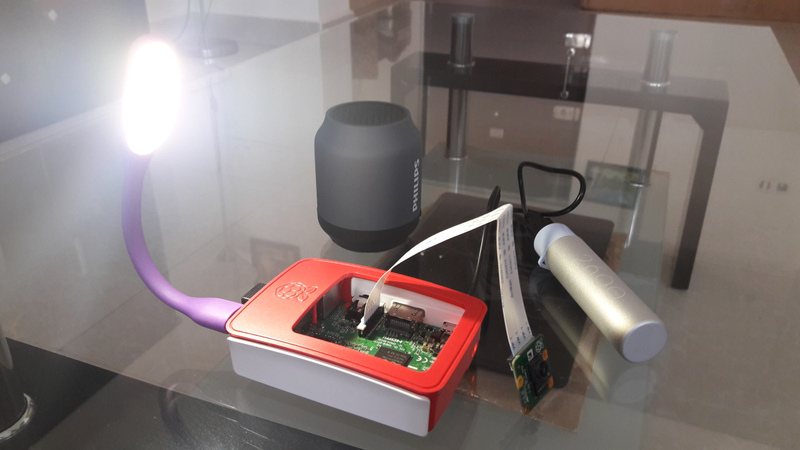 Uses Raspberry Pi camera to take a snapshot image, recognizes items in the image, and reads the output aloud using the AWS Polly's text-to-speech.